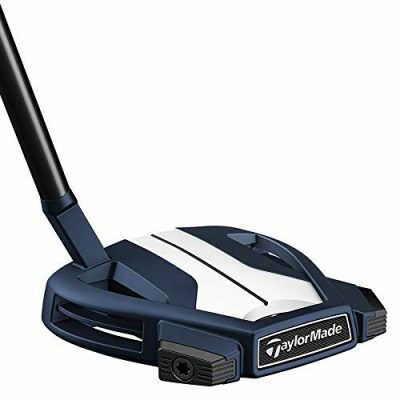 TaylorMade has become popular for their drivers and fairway woods but recently they’ve gained ground in the putter market as well with their Spider Tour putter. A lot of the credit can be given to Jason Day and Dustin Johnson who both play with custom versions of the TaylorMade Spider Putter. Dustin Johnson, for example, loves to wear navy blue on tour if you’ve ever noticed his wardrobe. 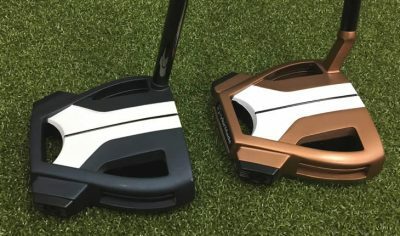 TaylorMade recently came out with a Spider Tour X model in navy blue as a result but also has a Dakota Copper which brings back the bronze style putters of golf years ago. 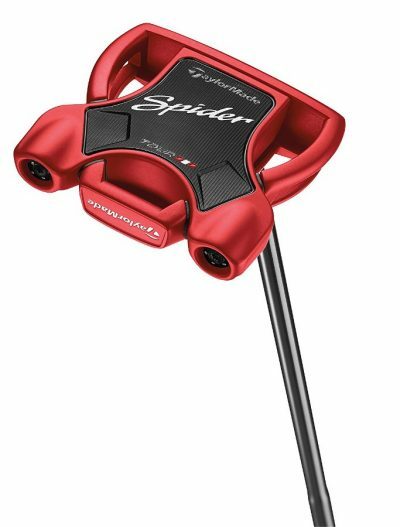 More popular, however, is the Red Spider Putter which is the version seen in the bag of Jason Day that helped kick off the popularity of the Spider Putter Series. If you look closer at the two images above, you’ll notice the Spider (red) and the Spider X (blue or copper) have different designs. Look closer at the back of the putter head and you’ll see the new Spider X has replaced the “rocket” pods with two steel weights. This change in design helps move the mass towards the rear corners of the putter and since it’s evenly distributed on both sides, this putter qualifies as a face balanced putter if you’re looking for that style as opposed to a toe weighted putter. Another design change made is in the body of the putter. TaylorMade made the central section of the putter head with carbon composite. The carbon composite weights 12g instead of 79g like the previous steel design. The weight savings in the center section were actually pushed to the outer frame edges of the putter which increases the MOI, helping mishits maintain speed and not end up short. Despite being 5% smaller in headsize, the Spider X has the same MOI as the Spider and overall the Spider X weighs more than the original Spider putter. These improvements provide the high MOI Spider Putter with better stability and increased forward roll. TaylorMade increased the face thickness of the Spider X putter which also allows the Pure Roll grooves to be deeper in the face and create better topspin for a more “pure roll” on the golf ball upon immediate impact with the face insert. This deeper, thicker padded face insert also creates a firmer feel to putts hit and the sound is more solid with less “metalic ting” that you might hear on a hollow, aluminum face insert. Overall feedback on putts is exceptional. You can quickly see why the tour pros love using the TaylorMade Spider X after stroking some putts from various distances. The face MOI was increased so that tour pros that mishit the ball just centimeters off-center still get great feedback on the putt and the distance isn’t lost. Take a look at the sweet design of the Spider X.. The visual “white” stripe with black alignment line, was specifically designed at half the width of a golf ball to help you better align the ball. After much research this was deemed the optimal width. You have your choice of either a full hosel offset or a 3/4 hosel offset depending on your preference of a face balanced putter or one with 30 degrees of toe hang to promote more arc in the swing. The 3/4 hosel offset will create toe hang to help you close the face the same as a blade putter but you get the additional benefit of high MOI design with the Spider X putter. Every model of the TaylorMade Spider X putter comes with the SuperStroke Pistol GTR 1.0 grip. Take a look at them here on Amazon to get an idea of what reviews are from others. Overall, this is a very solid putter from a performance and design perspective. It’s only drawback might be the price as it can run close to $350. Roll feels great off the face helping you gain confidence on short putts inside of 10 feet. Longer putts also have exceptional feel to help you hone in your distance control and touch with this putter. Having two design options for the hosel off-set is also super important to help you fit your putting stroke style of straight back or slighty arcing. In my opinion, this is one of the best performance putters and why I am giving it a 9.5/10 review. Thanks for reading our review of the TaylorMade Spider X Putter. Make sure to check out our resources below that golfer’s love following to improve their scores quicker. We’ve helped thousands of golfers and look forward to helping you too!